If you’re having abdominal pain or discomfort that doesn’t seem quite normal, it’s possible that you have an ovarian cyst. These small fluid- or tissue-filled pouches on or in the ovary are actually very common. Here’s what Ob/Gyn Mark Dassel, MD, says you need to know. The good news is that the vast majority of ovarian cysts are harmless. Here’s a look at the most common types. Functional cysts. This is the most common kind of cyst, occurring as part of the normal menstrual cycle due to ovulation, says Dr. Dassel. Every once in a while, a functional cyst may fill up with blood, making it swell and cause pain, but they’re normally painless and generally go away on their own over the course of a few months. Dermoid cysts or teratomas. Women are often born with this type of cyst and “it can be full of all kinds of things that the body grows, like hair, teeth and even thyroid and brain tissue,” Dr. Dassel says. Very rarely, teratomas may become cancerous. Endometriomas. “These cysts develop from endometriosis (a condition in which your uterine cells grow outside of your uterus) and they can be very tender and painful,” Dr. Dassel says. Why do ovarian cysts develop anyways? Beyond ovulation, endometriosis and the abnormal reproduction of cells, a pelvic infection like pelvic inflammatory disease (PID) can also cause ovarian cysts. Do you always know if you have an ovarian cyst? 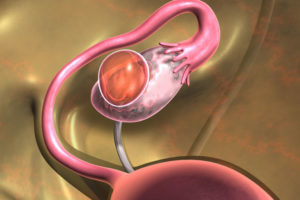 Ovarian cysts are usually small enough that most women don’t even realize they have one. In fact, Dr. Dassel says that many cysts are diagnosed during annual pelvic exams or imaging tests that are performed for another reason. Even cysts that become enlarged often go unnoticed. However, “if a cyst gets big enough, it may create a feeling of pressure or even pain,” Dr. Dassel says. Changes in bowel movements or urinary habits. Unanticipated weight loss or gain. Feeling full too quickly when you eat. Pain on one side of your lower abdomen. These symptoms can be easy to ignore, and one by itself may not be concerning. But if you’re noticing many of these together, that’s a good reason to see your doctor for an evaluation. A cyst that bleeds, bursts or causes your ovary to twist on itself (a condition called ovarian torsion) can cause sudden, severe pain. What happens if you do have an ovarian cyst? If your doctor finds an ovarian cyst, you’ll most likely have a pelvic ultrasound to see what’s going on and treatment will depend on your situation. If you experience intense pelvic pain, especially if it happens quickly, you need to get help immediately. Since a twisted ovary can reduce or stop blood flow, the sooner you get medical attention, the better chance there is for your ovary to be saved. For general pelvic pain, “there can be a lot of causes, and sometimes they can be difficult to differentiate. In these cases, it’s best to go see someone who’s trained in pelvic exams to see if they can localize where that pain is because sometimes it’s very obvious,” advises Dr. Dassel.